Seborrhoeic keratoses are also known as seborrhoeic warts and are benign growths due to a build-up of skin cells. They are very common, harmless, often pigmented growths on the skin but because they can be very large and very dark, they often raise unnecessary alarm. The most important fact to know about seborrheic keratoses is that they are always completely benign and NEVER develop into skin cancer. Despite their name, seborrheic keratoses have nothing to do with sebaceous glands or viral warts. We don’t know what causes them but some individuals may inherit the tendency to develop them from their parents, especially if they are from Scottish descent. Seborrheic keratoses are harmless and usually do not cause symptoms. They can sometimes itch, become inflamed, and catch on clothing. Many people dislike the look of them, particularly when they occur on their face. They have a rough surface, and range in colour from flesh-coloured to golden brown to almost black. They can affect anyone, but on dark- skinned people they can also appear as multiple small dark brown or black bumps, especially on the face and the neck; in such a case this is called Dermatosis Papulosa Nigra. 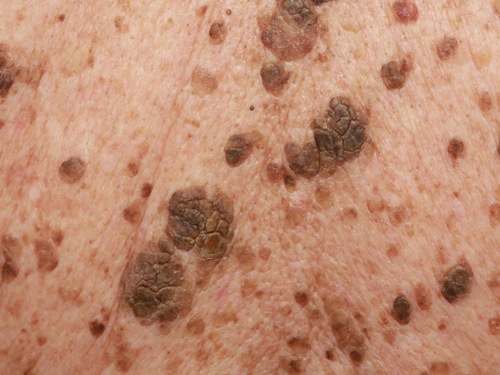 Seborrheic keratoses give the impression that they are stuck onto the surface of the skin and some look like small pigmented skin tags. You can happily co-exist with your seborrheic keratoses but if you would prefer to have them removed there are a variety of ways to do so simply and without causing any scarring. The dermatologists at Atlantic Dermatology and Laser will discuss with you the best way forward should you wish to have them removed.